"AFTER 5 DAYS, I'M SO DONE WITH CHICAGO." I told Abhishek. I did not realize this trip was long until I got to the fifth day and I had four more days to go. I have learned so many things from this trip to Chicago. A lot of people asked me what brought me to Chicago, "Travel." I responded. Some people was surprised when I told them this whole trip was going to be 9 days. It was a FREAKING long trip. Willis Tower, the second tallest building in the US. Travel alone is very easy. Travel doesn't have to be expensive. Walking more. You do not need to Uber or Lyft every time. Public transportation is very cheap and convenience. People are willing to help you. You just need to ask. Call your family sometimes. They might be wondering if you are still alive. Most of the places has free Internet. Do not let your phone dies. Sunny day in Chicago. Trump tower is the forth tallest building in the US. A couple months ago, I asked my dad if I should invest my saving in Bitcoin or other investments that let my saving works for me. "Those investments do have risk. You also need a very big amount of investment to see the differences." My dad answered me the next day after he took a look into Bitcoin. He was right. These investments need a big amount of money and time. I do not have those. I might be in the US for only two more years. My saving is good enough for me not to worry about a year or two. I'm in a sweet spot of my life. 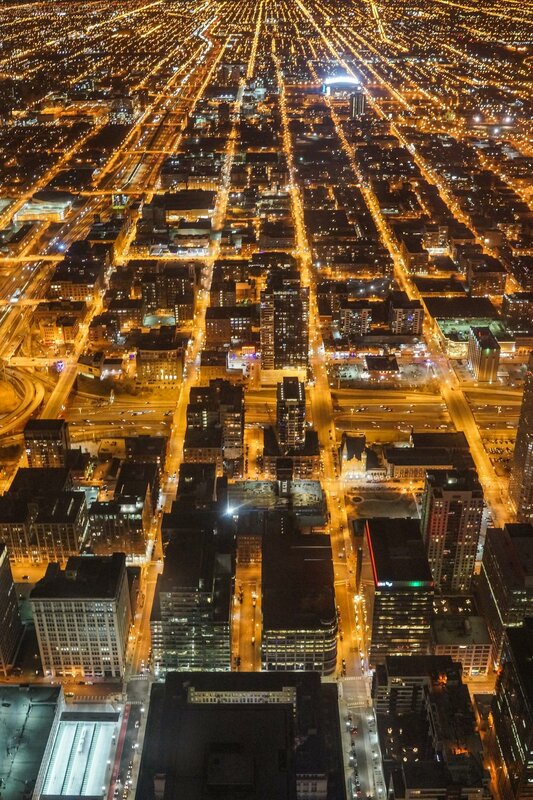 Chicago city, the view from 360 Tower. I wanted to take night pictures of Chicago downtown. Pop, a Thai student from UNT, joined me this trip. Keaton was tired from walking all day. He dropped us at the train station close by his house and we used the train to downtown. I noticed that I took less pictures in cold weather. I didn't want to take my hands out from the pockets. Long exposure shot at Cloud Gate. Abhi and I went to do a family session for the Fosseys. We had so much fun spending time with them. I also did a laundry at their house. lol Check their pictures from the link below. You can get a ticket to John Hancock Obervatory cheaper from Groupon. One ticket allows to visit the observatory twice in 48 hours! Isn't that amazing! We visit the observatory in the afternoon and we were planning to visit Willis tower at night. The view from 360 Chicago. Tilt is another ticket you have to buy separate from a general admission ticket. We were waiting in the line for 2 hours. We were very tired when we got to the top. After almost an hour, we reached the elevator. We stuck here for a good time because people do not move. We ended that night at House of Blue. Sit and eat please. Abhi and I headed to Goddess and The Baker for breakfast. Then Abhi took Uber to the airport and I walked to train station heading to Michigan City.